The most widely used wood carving tools are chisels and gouges. Each chisel or gouge has a blade, a shank, a tang, and a handle. Chisels have flat blades, whereas gouges have curved or angled blades. Blades are made from high carbon steel, while handles are made from wood. Chisels, also known as firmer chisels, have blades that are straight across the tool width. When the chisel cutting edge is at an angle, the tool is called a corner chisel or a skew chisel. It can reach angles and corners where other tools can't reach. A carving chisel has a bevel on both sides of the blade, whereas a carpenter's chisel has a flat face on one side of the cutting edge and a bevel on the other side. The cutting edge on a gouge is curved to a greater or lesser degree across the tool width. 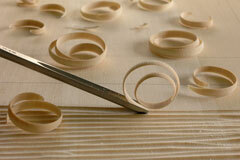 There are hundreds of types and sizes of gouges, and they are the most used carving tools. Their cutting edges can range from about 1/8 inch to 3 1/2 inches. The curve of the gouge blade forms an arc or sweep. An arc is a section of a circle's circumference. Thus the gouge with a sweep can be rotated from side to side to make a clean cut in the wood. Gouges with a pronounced sweep are called quick gouges. Gouges vary in depth and curve. Each tool has a specific use. The cutting edge arc may be shallow, medium, or deep. Flat gouges are curved across the tool width so slightly that they are almost flat. They are used for flat surface work where a chisel corner might damage the wood. Other gouges are u-shaped and have a semi-circle curve shape with longer extended sidewalls. The sidewall may be straight or curve out slightly. These tools have deep U-shaped profiles and cannot be rocked when cutting. Blades can have either straight or curved shafts. Bent gouges and chisels are used for cutting deep hollows. The shaft can be long bent (bent along the whole shaft length) or short bent (bent at the far end from the handle). Short bent gouges can be front bent or back bent-the gouge's mouth hollow is either at the front or back of the bend. 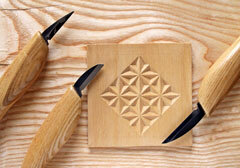 The V-tool chisel is used to crisp corners and divide areas of a carving. As a result, it is also called a parting tool. Other angled tools that were originally developed for the furniture trade are the macaroni, fluteroni, backeroni, and wing parting tools. Veiners and fluters can be used upside down for decorative work or to cut channels in the wood's surface. These tools produce softer cuts than V-tools. 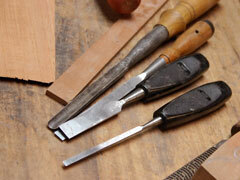 Wood carving knives may also be needed for stop cuts, shaving, rounding edges, and other small detail work. Special chip-carving knives, also favored by whittlers, are used to decorate a wood surface by cutting out small v-shaped wood chips. A starter set of tools might include two gouges with medium or shallow curves, a v-gouge, a fluter or veiner, and a flat gouge. 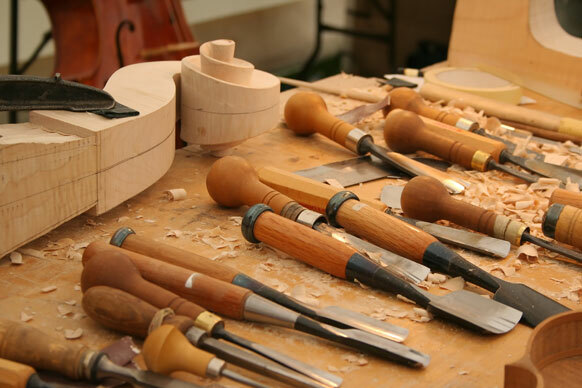 Wood carvers will also need a flat chisel, a skew chisel, and a round wooden carver's mallet for striking the ends of the chisel and gouge handles. These mallets have short handles and come in different weights from light to heavy. The weight of a mallet helps ease the work of cutting through the wood. Some carvers like to make their own handles rather than buying a tool with an attached handle. They use different types and colors of wood, shaped differently, for various tools. Thus a carver can easily recognize a tool by its handle. Custom handles can also control the length of the tool-a longer handle for a short tool, or a handle that is designed to fit the carver's hand. Pre-shaped handles can also be trimmed, reshaped, or marked to identify them. Carvers often burn their names into their tools' wood handles.